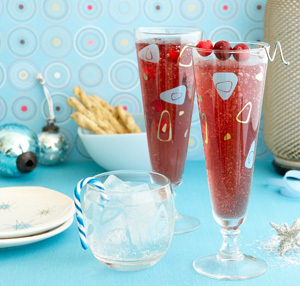 Save Money and Celebrate this Holiday Season with a Retro-Themed Cocktail Party! The winter holiday season is upon us and so are the cocktail parties, dinners and get-togethers. Even though financial times are tough and we all lead busy lives, you can still put together a fun, easy and rather inexpensive soiree for your guests. When most of us think about the holidays and the feel-good food from our childhood, we remember the simple, yet delicious dishes our parents served. An idea that seems rather fitting this year (and not just because of the current “Mad Men” obsession!) is hosting a “retro-themed” party. The 1950’s was all about family, friends, entertaining and leading the simple life. For little money and effort, you can put together a spread that will bring us all back to holidays past. The 1950’s cocktail party menu was a simple one… Passed hors d’oeuvres (appetizers) consisting of both hot and cold small bites and finger foods. Start with cold items you can easily pour from a can or jar, like salted almonds, cocktail onions, Chex Mix, pimento-stuffed olives and cornichons. Next, go with some quick, assembled foods, like a variety of canapés, deviled eggs, fruit kebabs, broiled grapefruit (a 1950’s classic), shrimp cocktail, cream cheese stuffed celery and potato chips served with onion dip or deviled-ham dip. The popular hot appetizers of the time included food wrapped in bacon, fondue and tidbits in “blankets”. For this part of the menu, I would take an old-time favorite and add a modern twist to keep it fun and interesting. The popular bacon-wrapped dish of the time was Rumaki – water chestnuts and chicken or duck livers skewered and wrapped in bacon. It had a definite pseudo-Polynesian feel to it. How about scallops and pineapple chunks marinated in a soy-based sauce, wrapped in bacon and broiled? Shrimp, swordfish or chicken breast cubes would work well too. For the fondue, the options are limitless. 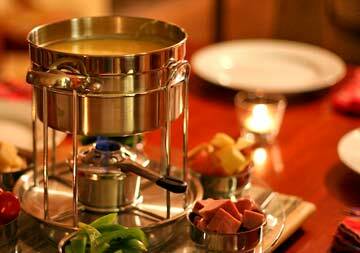 You could do a savory cheese fondue, a broth fondue for cooking little bits of meat or a chocolate desert fondue served with strawberries and pound cake. My personal favorite this classic cheddar cheese and hard cider fondue, served with chunks of bread, apple slices, cubed ham (or chicken sausage) and fresh vegetables. Lastly, who doesn’t love good ‘ole pigs in blankets? You can wrap other things in “blankets” too though, if you’re not a big fan of cocktail sausages or hotdogs. Try slices of gourmet chicken sausage or grilled asparagus. You could do a modern take on the classic cheese puff by doing a goat cheese wrapped in phyllo as well. For cocktails, traditional is best, making sure you include one or two martinis and some type of punch, like this Fish House Punch, which was featured in Gourmet Magazine in July 1951 (R.I.P. Gourmet). Little plastic cocktail hangers and swizzle sticks add a nice touch. For decorations keep it easy and inexpensive… think glittery garland and a tree covered in tinsel. Put on some classic holiday tunes or a little lounge music and you’re ready for a fun celebration!